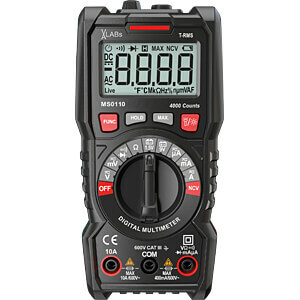 The True RMS (TRMS) digital multimeter MS0110 with automatic range selection and its 4000 counts LCD enables the most important measurement functions as AC/DC voltage and current measurement up to 600 V / 10 A as well as resistance measurement up to 40 MOhm. Further the CAT III multimeter is equipped with diverse special functions as a non contact voltage detection (NCV), continuity test, diode function and battery test. The integrated LED working light enables the user additional the measurement with the multimeter in bad illuminated environments.